Inspired by an encounter with Indians in West Virginia during his childhood, his reading of Cooper's Leatherstocking Tales, and the Indian paintings of Henry Farny, Sharp sought to record the life of Native Americans. He resided in Taos, New Mexico, during the summer, when Indian models were readily available, but spent the fall and winter in Montana, when the nomadic Plains Indians had more time for posing. Montana, he felt, was too green in the summer, but "the snowy landscape, sage brush foothills, and winter foliage along the Little Big Horn River are more paintable." He complained, however, that patrons would not purchase his landscapes "unless I put those darn tepees in." Setting Up Camp shows Crow squaws preparing their tepees along the Little Big Horn River in early fall, a distant mountain already covered with snow. The painting offers several interpretations. For the European-American male observer of Plains Indian life in the 19th century, the female was little more than a "Beast of Burden, " as typified by the comments of Lt. George Palmer: "The men are indolent and slothful, and look upon labor as degrading and only fit for women. [...] They compel their women to do all the labor, often reward the overworked creatures with neglect and cruelty. The squaw must move the tepees from place to place, tan all the skins, gather wood, provide the winter supply of food, and take care of the ponies, pappooses and dogs; while her lazy buck rides his horses or lies on soft robes [...]." Although Sharp was sympathetic towards the Plains Indians, who he described as "dignified, courteous, and friendly always-human, " he also felt that the Crow braves demeaned their women, who were compelled to "work like mules" while the men hunted and loafed. In recent studies, however, it has been suggested that the woman played a much stronger role in the tribe. Their tasks were no more burdensome than that of many white women, but unlike the European household, camp was the domain for the squaw: "The tipi, its furnishings, the food in it, clothing and other manufactures belonged to the woman, hers to give as she pleased." 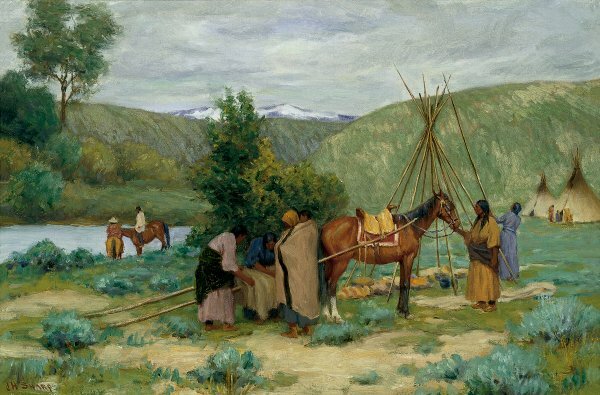 Sharp's painting portrays the communal sense of labour among squaws of the tribe as observed by Walter McClintock in 1910: "Women considered that this work was their rightful vocation and allowed no interference from the men of the family [...]. The superiority of women in all household arts [...] was a marked feature of their social life." The painting shows a site on the Little Big Horn River, not far from the log cabin and studio that the artist erected near the battlefield of Custer's Last Stand. General Custer was a childhood hero for Sharp, who was sixteen when the massacre of his troops took place at the Battle of Little Big Horn in 1876, yet the painter eagerly sought out the braves who had fought against his troops, recording them in over two hundred portraits. Sharp was deeply aware that the 19th-century warriors were a rapidly vanishing race and wished to accurately record them before their passage from existence. "I was attracted to the human side of the Indian", he wrote, "their romance and idealism are the most beautiful symbols brought down in the annals of time; their religion, their legends and superstitions are all unique."